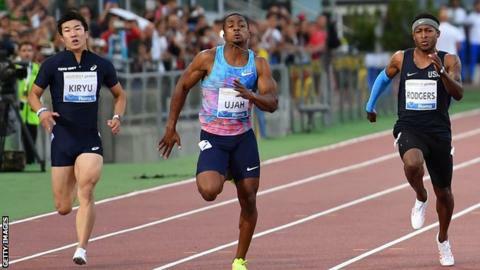 Britain's CJ Ujah won the 100m with a season's best time of 10.02 seconds at the Rome Diamond League on Thursday. The 23-year-old edged out France's Jimmy Vicaut and American Ronnie Baker, who were both clocked at 10.05 seconds. "My focus was to be free and run free," said Ujah, who is now looking forward to the World Athletics Championships in London in August. "London is the main one. I hope I can do something special then." Ujah's fellow Briton Desiree Henry was sixth in the women's 100m as the Netherlands' Dafne Schippers took victory from Marie-Josee Ta Lou of the Ivory Coast and Michelle-Lee Ahye of Trinidad and Tobago with a time of 10.99. Morgan Lake equalled her season's best of 1.91m for fourth in the women's high jump, won by Russia's world champion Mariya Lasitskene (formerly Kuchina), competing as a neutral athlete while the country remains suspended from international athletics. Andrew Pozzi ran 13.24 secs for fourth in the men's 110m hurdles, won by American Aries Merritt in 13.13, while Holly Bradshaw was seventh in the women's pole vault, won by Greece's Katerina Stefanidi with a world-leading height of 4.85m. Steph Twell was 16th in the women's 5,000m with a season's best of 15 minutes, 24.05 seconds. The race was won by Kenya's Hellen Obiro in 14:18.37, a world leading time and national record, while Eilish McColgan did not finish.